We have a deep, real need to be in relationship. We want to be vulnerable with others, and have others be vulnerable with us. We want someone to know us, to know our business. We want to know another person's business! Why do you think we have a multi-million dollar gossip magazine/website industry? There are literally million of people who are seeking vulnerability, wanting that feeling of being part of a celebrity life. 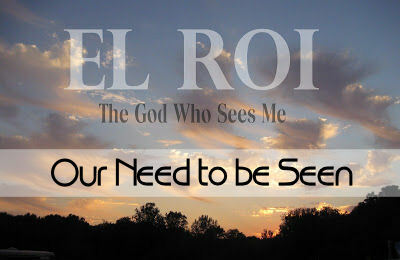 God promises use a much better form of being seen, on earth. He gives us the ability to be vulnerable, and see by Him. He also enables us the ability to be seen by others here on Earth. Hagar, the broken alone servant girl, mother to Abraham's illegitimate child Ishmael. She is sitting in the desert watching her child starved to death, after being thrown out of her home by Abraham's jealous and bitter wife. She is alone and rejected. She is filled with terror for her child. She is running from abuse, from sin, from pain. In this moment, God meets Hagar int he desert. But he didn't just meet with her, He SEES her. 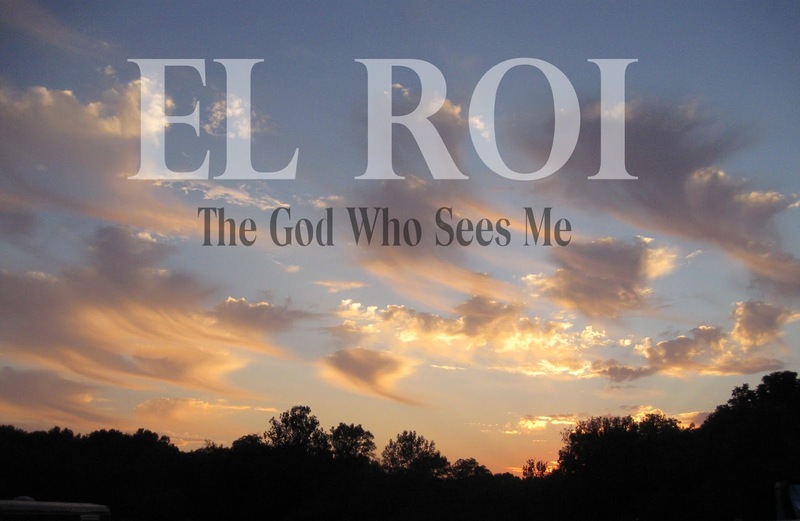 The name of God Hagar uses is El Roi-, meaning The God Who Sees Me. This is the only time in the Bible where this particular name is used for God. What awesome beauty in that. God saw a scared, lonely, hurting, and broken girl, and he saves her. Don't you want that? To be seen in your most painful and fearful moments, and still be loved by the God of the Universe. God saw her. And I promise you He sees you. He sees me; the broken, lonely girl that I am. He see me when I am filled with fear for my children. God is our first example of what true vulnerability looks like. Hagar is not at her best before God seeks her, she is at her most honest. In Hagar's story, God seeks out this broken girl. Sometimes those who are hurting will come to us for help, but that takes immeasurable bravery. We are called to be observant of those in need, to always seek a love of understanding. There are seasons in life where others may be too raw, or just plain exhausted to share what they need to others. They need you to seek them out. Vulnerability is slowly given through time and trust. Be a person others can trust-No one will confide in you if you the type who find secrets as currency. It may be subtle, but sharing others hurts, even in the context of a "prayer request" will damage any trust you have built. Listen to their story- Ask open-ended questions about their story, their life. They don't have to be super deep, but they must be genuine. Were they in sports? Why do they love owls? In my experiences, vulnerability can happen when you feel like some genuinely just wants to know your story, just for the sake getting to know you better, no judging involved. Talking is not the only way to build vulnerability. Some people are not able to process their struggles verbally, but they still need you. My prayer is to discern how I can see another person's unspoken needs. When you know someone is struggling, DO NOT ASK "How can I help?". Just start helping. Bring a meal, pick up their kids so they can have a date, etc. I once had a friend just tell me, not ask me, he was picking up my kids that week for a play date so I could get my every growing pile of work done. I would have never asked him directly to do this, but I was immensely grateful. These types of unsolicited service show someone you see their need, you show you see them. Vulnerability is a scary thing. Seriously. But I can say from experience, the value outweighs the fear. I am the firs to admit there are seasons when you need someone to help pull you of the pit without being asked, but we know one can supernaturally see into our hearts, but God. I have been guilty of unfairly thinking loved ones can only show love if they first observe my need without me saying it (anyone else unfairly expect your husband to be a mind reader?!?!) I have failed to be honest when I am feeling worn. Sometimes I don't share because I have a real fear of being "needy". I love that my husband can sometimes mistake me for Super Mom, but respectfully admitting to him I need his help is best for me and our marriage. It also just plain unfair, and fruitless, to expect others to supernaturally see those places that are emotionally raw. After growing up in an abusive household, I have triggers. It is just a fact. Everyone has some, we are all raw and sensitive about something. It is important to know we are all human, and your friends will make mistakes, say the wrong ting sometimes. This will especially happen in those friendships where you are trying to grow a deeper intimacy. God is the only who can See your heart, but he graciously gives us friends and family who would love to know you, to see you. Satan doe not women to be vulnerable with other women. Satan hates Godly Female Friendships. He knows how powerfully a woman's life can change for God when she is surrounded by other Godly women; spurring her on and encouraging her in life's struggles. I have seen the battle firsthand, and I have seen the life changing power of a women ministering to other women. Remember this as your seek a deeper intimacy with a female friend. Our honesty in relationships must begin with our relationship with God. I have to be honest with him about my doubts, my sensitivities, my sins, and my heart. The beauty is he has already seen it all, and still loves me. From that confidence, I can be courageous with others about my heart. Comforting others is a tried and true road to healing. My personal testimony has been that sharing vulnerable moments with another in their hurt can unexpectedly bring about the healing you were seeking. The Holy Spirit has often brought me a new perceptive on on my own pain,while I was seeking to comfort someone else. I know I can get so blinded by my own hurt and grief, that the idea of comforting another seems almost impossible. I am not saying there are not seasons of grief where we are just the receivers of comfort, I just came out of one. I had literally nothing to give anyone. But there are, but ability to share the pain & burdens with our sisters and brothers in Christ is what the church was designed for, and ultimately one of the ways God brought me healing. Vulnerability leads to intimacy, and intimacy leads to accountability. God sees our whole heart, the yucky parts too. If we are not willing to also share the worse parts of us, then we are not truly genuine when we share the good. If we want others to see us, we need to be willing to receiving truth from others. Nathan was the prophet who had to wisely, and lovingly, confront David on his sin. The Nathan loves you enough to speak truth in way that brings about repentance. A warning for those who think themselves natural "Nathans". You can not be a Nathan to a stranger. You must love the person as much as they love the truth you need to share. Nathan cared enough about David to study him. He knew the most effective way to bring about a better intimacy with God for David. Be careful not to take the name of "Nathan" until you check your motivation. Are you wanting another to repent to you (i.e admit you were right? ), or to repent to God and grow closer to Him? Godly Wisdom is essential when deciding who let see your true heart. Below are three important rules I have had to learn (almost all hard way). Women Need Women. Men Need Men. A person can be inappropriate for you to be intimate with, based solely on their gender or your other relationships. For example, it is inappropriate for a married woman sharing her deep heart struggles to a man who isn't her husband, in turn creating an intimacy that is to be reserved solely for your mate. Keep Your True Circle Small. Vulnerability 'spread too thin' can also be unwise. It can be a challenge to discern where to be vulnerable in a world of social media, with hundreds, if not thousands, of online "friends". Some feel perfectly comfortable with dozens of "deep' friendships, but my experience has proved a few deep relationships are much more fulfilling to my need "to be seen" than several acquaintances. Jesus only had 12 disciples, and of those disciples, only 3 truly saw him transfigured on the Mount. Vulnerability is a two way street. There are people who seek only to be seen, with no intention of 'seeing' you. We have all had that friend, who spends 90% of the conversation on their problems. Don't get me wrong, is important to connect through shared experiences & connecting stories! When someone speaks of their dog problems, you can encourage with a story of your dog. These are shared to help the other person, not to bring the spotlight back. It is not okay for every conversation to always end up ultimately about solving their life. Some people may expect you to carry their everyday loads, with no effort on their part to carry their own load, and with no reciprocity involved. While there is healing to be found in helping someone through their crisis, be aware of a lop-sided relationship that will eventually become unhealthy for both parties (i.e. Co-dependent) If you feel like you are in a lop-sided relationship, I highly recommend by "Boundaries" Dr. Henry Cloud and Dr. John Townsend. Only because we are made in His image can we see others, I praise Him for that gift. I pray I use it wisely for His glory.